Find out more about the violin, how to play it and how to choose the best one for your needs. The violin is one of the most beloved instruments for its wide range of tones and its versatility in many different types of music. Through this 86-minute video, you can learn more about this important instrument and find out the fundamentals of playing it. 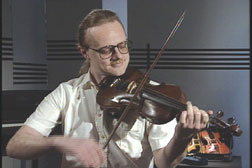 Ric Sanders, a well-known fiddler who plays folk and rock, leads readers through a better understanding of the violin. Learning more about the composition of the violin, how to choose one and the components of the bow are just the start of this instructional video. The use of rosin on the bow and paste on the pegs as well as how to hold the instrument and the bow properly are also covered. Find out how to tune a violin, how to finger it and get a solid start on reading music. At the end of the video, hear Sanders give a performance of this acclaimed instrument.